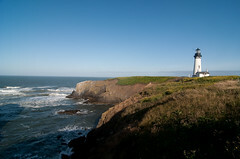 As I’m sitting in my windowless office today, very tired mentally and physically from what seems like an overwhelming flood of information that has come my way, this photo of Yaquina lighthouse helps calm my tense nerves. We had driven by this picturesque lighthouse the previous day, on the way to Depoe Bay, with the intention to go back when the sun was setting. However, the view from our own deck at the Whales Rendezvous B&B was so amazing that we just stayed there. So, being the crazy person that I am, I got up early the next morning and drove the 10 minutes back to Yaquina head for some almost-sunrise photography (sunrise was about 5AM, so 6:30 felt close enough…). The wind was incredible. Quite literally – if someone else recounted the tale of how windy it was on that bluff, I would not find the store credible. I truly felt that I was going to be blown right off into the ocean. At the same time, here was this beautiful lighthouse, on a remarkably lush bit of rock (the mystique of lighthouses tends to make people forget that they are built to keep boats away from rocky, dangerous, hard-to-reach and often quite ugly areas – this one was in a much nicer location). The sun was beautiful (though did nothing against the cold of the wind) and as I approached the stairs leading down to the beach for some different angles, I looked over my shoulder and found this. Even with the memories of that ridiculous wind, this photo warms my spirits as I think of the clear skies, the early sun, and the picturesque lighthouse.